This baking soda mask for acne is one of my favorite go-to remedies. I use it regularly to prevent breakouts and also help heal any breakouts. Whenever I have a breakout coming up, I use the mask even more often as a spot-treatment. I love using products with simple ingredients when it comes to my skincare routine, which is why I love using a baking soda mask for acne. It is simple, cheap and does wonders for my skin! It is so easy to make I don’t even bother using store bought masks anymore. This recipe for a baking soda face mask for acne is one of the easiest recipes that I have made. All you need to do is mix water, baking soda, and lemon juice until it forms a paste. Then you apply the paste all over your face. Baking soda balances out the pH levels of your skin. 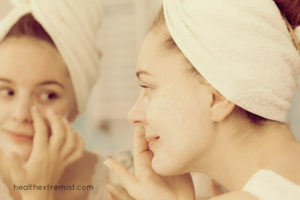 In fact, pH imbalances can lead to acne. Baking soda also dries out your skin, which is why it is wonderful to use a baking soda mask for acne if you are prone to oily skin. When you combine the baking soda and water to make a paste, the baking soda works as a great exfoliator. Exfoliation removes dead skin cells and dirt to prevent future breakouts and blackheads. Even though baking soda is an exfoliator, it is less abrasive than salt or sugar scrubs. Using a baking soda mask for acne makes my skin so soft afterwards. Adding lemon juice in your baking soda mask for acne is crucial. Lemon juice disinfects your skin and removes excess oil. The lemon juice will make your skin feel tight because it acts as a toner and closes your pores. Putting a dash of lemon juice in your baking soda mask for acne will help fight any current breakouts you have and prevent new acne from forming. I love how the lemon juice tightens my skin, I can actually feel it working! 1. Mix the water, baking soda, and lemon juice together. It will form a paste (pictured above). 2. Apply the paste to your face. You can apply it all over or just to breakout prone areas. Sometimes I only apply it to any breakouts coming up. 3. Let it sit for ten minutes then rinse it off with warm water. 4. Optional: Apply jojoba oil or hempseed oil to your face as a moisturizer. This will help prevent any dryness after using the baking soda face mask. Hempseed oil is my favorite because not only is it moisturizing, but it helps fight acne too! If you want to exfoliate with the mask, massage it into your skin and rinse with warm water immediately. If you want to use it as a spot treatment, apply a fingertip sized amount to the problem area on your skin and let it dry before rinsing it off. After you rinse off the baking soda mask for acne remember to apply a good moisturizer! • This Baking soda mask for acne can cause dryness or irritation if you have sensitive skin, so test a small amount on your arm before applying the mask to your whole face. • Only use this mask once or twice a week. The baking soda will dry out your skin too much if it is used too often. In addition, to using this baking soda mask for acne, I made many changes to reduce my breakouts. I’m also working on treating my ice pick acne scars at home too. So far, I’ve had some good success with microneedling and red light therapy (this red light device that I use at home). If you’re interested in reading more, check out my acne-free e-book here. Very nice. I just keep forgetting the power of Lemon. The baking soda I believe is also good to bring embedded dirt to the surface. Thanks for the recipe Lori. Thank you for all the advice. I have acne on my face. They are very annoying and it is embarrassing. I tried many things to treat them but no results. Well, after reading your post I am trying the baking soda mask, just started today. Hope it works quickly. Keep us updated on how it works for you!